Above you can se a before and after of my latest and biggest project for a while – my hand embroidered Kånken. I bought this one in 2014 when I started university (after seeing it on someone in Copenhagen and completely fallen in love). I love it for it’s practicality because it fits everything and is still small and easy to bring around. But I was in the mood for something more fancy (like my Strathberry bag) but that would still fit my iPad Pro and preferably my computer as well. And since I’m really trying to adapt the minimalist lifestyle, a remake of my Kånken seemed like the ultimate solution! For you who are interested, here is a quick run through of the design process of my hand embroidered Kånken. Original Kånken – First I just took a look at the Kånken and tried to figure out where there was room for the embroidery. Then I considered the colors of the Kånken and which other colors that would match. Because it’s black and leather I decided that som natural brown-y colors would suit it perfectly and give it a bit of a vintage feeling. The next step was a trip to Pinterest to get inspiration and decide what motif and colors I wanted to use. I chose roses since I completely love them and they are very classic. Sketch with iPad Pro – The second step was a sketch (since I really love my Kånken as it is I didn’t want to risk ruining it with something that don’t look good.) So I took a picture and used my Ipad Pro to sketch until I was pleased with the look of it. Chalk drawing on Kånken – Now to the tricky part. Transferring my sketch to the bag. I used chalk and tried my best to draw directly on to the bag with my sketch as inspiration. It didn’t get exactly as the sketch but that’s not whats important. The most important thing is that the finished embroidery looks good. I also ordered the yarn I wanted to use. I went with eight different colors. 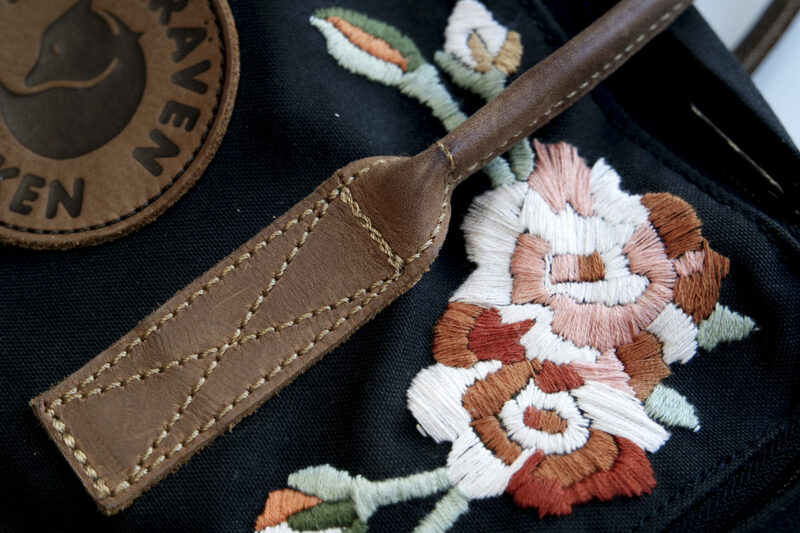 The finished hand embroidered Kånken – And then it was just to get started. And this was the slow process. 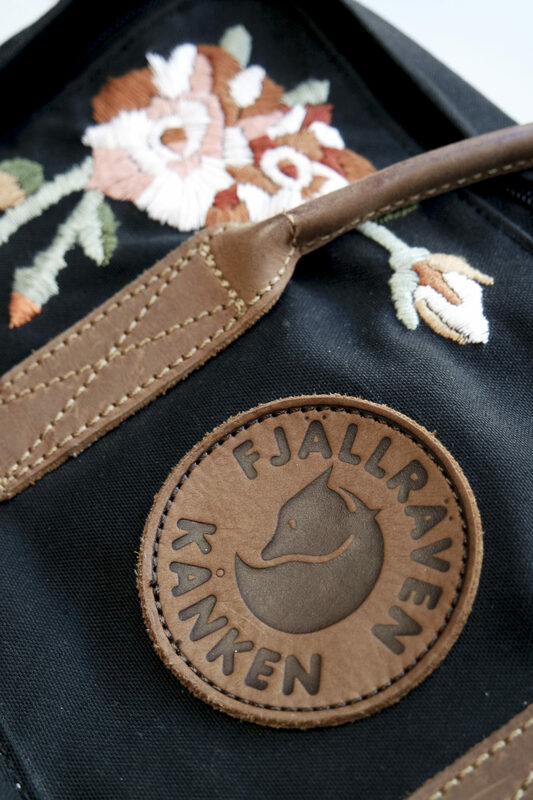 The Kånken got a quite harsh material which don’t make it optimal for embroidery. (which resulted in some sore and bleeding fingers) But with a bit of stubbornness anything can be done. And now I finally am! I brought it with me to Copenhagen and I completely love it. Since I put so much time on making it pretty I’ll probably keep it forever. It got so much more value to me now. And Kånken almost never breaks which makes it the perfect kombo. I also love the feeling of that it’s one of a kind. 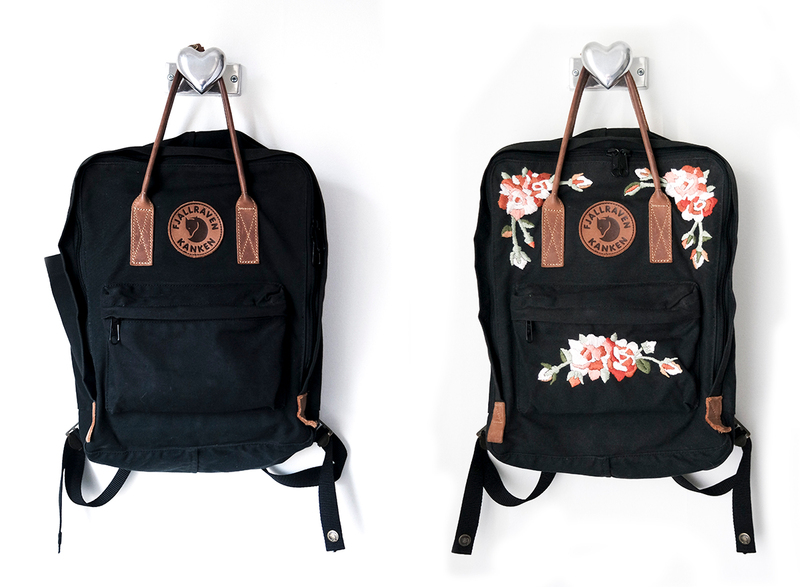 And best of all, I now no longer feel the need to buy a new bag so if you want a inconvenient way to get rid your craving to shop I highly recommend embroidering your own bag! What do you guys think? Leave me a comment down below!